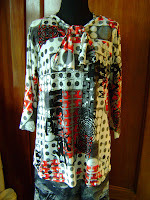 After the weekends disasters, I did manage to have some success with some dressmaking. I made this knit top with some fabric I got from work, it is from our next winters range. I promised to show you some of the projects I have been working on and have yet to finish. 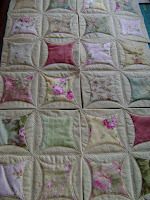 This is going to be a single bed quilt, when it is finished!! 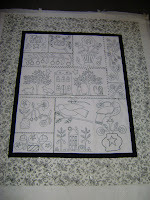 This wall quilt has yet to be quilted and have the binding sewn on. 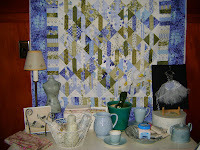 I like it as the backdrop behind this dresser, in my sewing room. And today I sandwiched this wall quilt together, ready to be quilted. So a few of projects to be finished and a few more hidden away, but I will save those to show you another day. NOTE TO SELF. Do Not Work With Cotton Batting While Wearing Good Black Dress Trousers!